May 3, 2016 – The Council for Global Equality joined 15 leading human rights organizations in writing to the State Department and the White House this week to express ongoing concern over the deteriorating human rights landscape in The Gambia following a series of arbitrary arrests involving police brutality and possible torture. This adds to concerns that we have raised with the Obama Administration over the past several years, including pointed questions about the targeted persecution of lesbian, gay, bisexual and transgender (LGBT) individuals in The Gambia. The government’s arrests and harsh suppression of protests last month, in advance of elections anticipated at the end of the year, have been condemned by local, regional and international human rights leaders. Amnesty International and Human Rights Watch reported that an opposition leader died in April under suspicious circumstances shortly after his arrest. The government’s brutal treatment of the opposition and the suppression of protests have been condemned by the United Nation’s Secretary-General, the African Commission on Human and Peoples’ Rights, the ECOWAS Commission and the State Department. There have been similar statements of concern from leading civil society in the region, including IHRDA, WACSOF and the NGO Forum at the African Commission. This latest crackdown is only the most recent chapter in a long line of abuses perpetrated against independent voices by President Jammeh’s regime since he seized power in 1994. 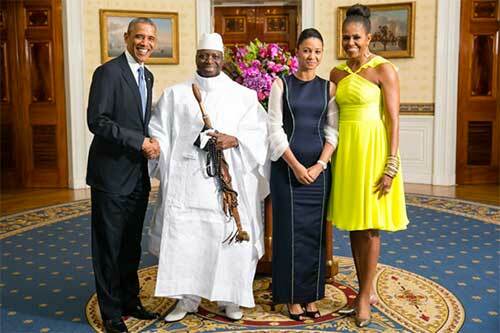 President Jammeh has also continued his inflammatory rhetoric against LGBT Gambians. In March 2016, when addressing the opening of the National Assembly, he said that homosexuality is “ungodly,” and “I will never tolerate it here in The Gambia. Those who will be caught practicing it will face the full force of the law.” These remarks are not empty rhetoric – the Gambian criminal code was amended in October 2014 to include much harsher sentences for various acts defined as “aggravated homosexuality.” LGBT Gambians have since been subjected to arrest and detention, torture, and other ill-treatment by state security forces. In light of these reports, the Council for Global Equality has renewed its call to take further actions against President Jammeh and his government. In particular, as previously requested, we have urged the Obama Administration to consider visa bans against Gambian officials guilty of grave human rights abuses, and to consider using the sanctions powers available under the International Emergency Economic Powers Act (IEEPA), which have been used in the past to respond to human rights abuses in countries such as Belarus, Venezuela and Zimbabwe. We have also asked the Obama Administration to cut any remaining security assistance to the government in the wake of these abuses. We urge the Obama Administration to take these steps now, before the pre-election violence spirals out of control in the shadow of elections later this year.